If you've forgotten what it's like to breathe fresh clean air, and your kids are convinced that milk is made in your local supermarket, it's time you experienced a real Victorian farm. Too far away, you say? Well, even the most hardened city dweller will find excuses hard to come by, as an authentic farm experience is closer than you think. So grab the kids, dust off your gumboots and visit historic Chesterfield farm. 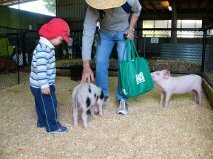 Open 7 days a week from 10am to 5pm, this once-commercial farm now operates purely for education and enjoyment. 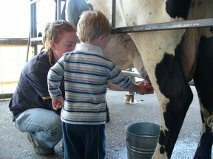 Located in the outer south eastern suburb of Scoresby, not far from Caribbean Gardens, Chesterfield provides children and adults alike with a 'hands on' farm experience that includes activities such as milking a cow, hand feeding a range of native and farm animals, tractor rides, sheep dog demonstrations and a baby animal nursery. 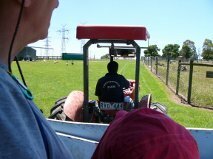 Many activities are included in the entry price (a family ticket costs $35), with extra activities attracting only a nominal fee - for example, tractor rides are $3. It is worth noting that whilst you can move around the farm to view each attraction in your own time, the easiest way to ensure that you don't miss the best parts is to attend the daily farm show, which runs at 11.30am on weekdays, 11am and 2pm on weekends/holidays. No doubt you will have worked up an appetite after all this, so head for the picnic area, where there are free barbecues and undercover seating (large groups are advised to book ahead). If you forget to pack your lunch, don't worry - there's a cafe on site. Why? If you've forgotten what it's like to breathe fresh clean air, and your kids are convinced that milk is made in your local supermarket, it's time you experienced a real Victorian farm.